While accepting the Mark Twain Prize for American Humor at the Kennedy Center on Sunday night, Eddie Murphy impersonated Bill Cosby. Though this is the kind of thing that would make headlines anyway — Murphy's imitation was uncanny and he touched on the numerous sexual assault allegations against Cosby — it's even more notable because it contradicts Murphy's earlier statement about why he refused to imitate Cosby during Saturday Night Live's 40th anniversary special in February. In fact, just last week Murphy explained to The Washington Post why he chose not to impersonate the comedian. "It's horrible. There’s nothing funny about it. If you get up there and you crack jokes about him, you’re just hurting people," Murphy told The Washington Post in a story that ran on Oct. 13. "You’re hurting him. You’re hurting his accusers. I was like, 'Hey, I'm coming back to SNL for the anniversary, I’m not turning my moment on the show into this other thing.'" SNL alum Norm Macdonald initially claimed that Murphy wouldn't play Cosby because "[Murphy] will not a kick a man when he’s down. Eddie Murphy is not like the rest of us. Eddie does not need the laugh." At the time, Cosby applauded the comedian. "I am very appreciative of Eddie and I applaud his actions," he told NBC News in a statement. 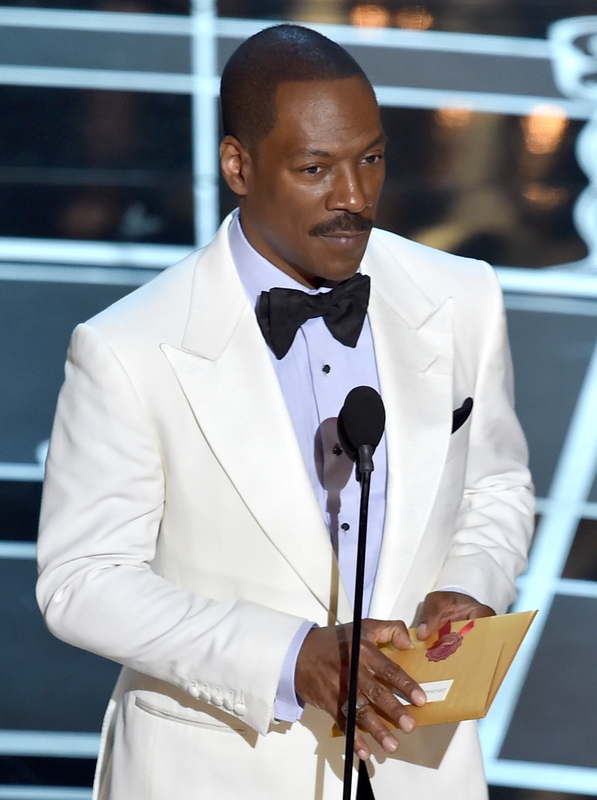 So, what made Eddie Murphy change his mind? According to fellow comedian Arsenio Hall, it was to add to the mounting media attention that could eventually force Cosby to confront the allegations. "[Eddie] said, ‘Because Cosby gonna get sick of this soon, he’s gonna get sick of people hating, and eventually he’s gonna have to say something,’” Hall told The Washington Post of Murphy's decision. "And we were like, ‘That is funny, man. Are you willing?'" Murphy — who Hall says practiced his routine in front of himself and Chris Rock ahead of his acceptance speech — apparently was willing, because he ended up calling out Cosby (a past winner of the same award) for losing many of his prestigious honors in light of the allegations. "You know you f*cked up when they want you to give your trophies back," Murphy joked to the crowd's uproarious laughter. "I would like to talk to some of the people who feel that I should give back my f*cking trophies," Murphy said in his best Cosby voice. "You may have heard recently that I allegedly put the pill in the people's stomach. If I ever see or meet this Hannibal Buress in person, I'm going to try and kill this man!"